It depends on the competence of the executive's assistant. If you were to read two letters which are exactly the same, but are in a slightly different form, would it trick you? Everything can work on someone, but you have to assume a degree of competence for something to work an experienced someone. I think different texts is the way to go, and you can mix-and-match paragraphs from different pre-written community letters to maximize the results:work ratio. Different paper sizes and different amount of papers (by varying font sizes and spacing) might work as well. Color, generally, doesn't work and makes your letter look tacky. The reason why it doesn't work is the mail can be read under many different lights, and therefore it's generally not a factor when filtering mail. If you send a radioactive-green text on a bright pink background, you won't be taken seriously, even if your letter is clearly different to the rest (and takes far, far more effort and focus to read). Different envelopes can work. If you go with a fancy one, the assistant might think it's more important and pass it through even if the content is a duplicate of an existing letter. This, however, raises the cost, so it might not be an option to everyone. So, is there one specific mailing address we should send our letters to? Wouldn't it be more effective if one guy got a hundred letters on his desk than if a hundred guys each got one? I listed the addresses in the order I thought they would be most effective. But that's the thing, no one really knows. The same person getting letter after letter may just have it filtered through their secretary (though the secretary may pass along the message that they're still getting the letters). Alternately, if we can get more addresses, the more managers at EA that actually talk about this, the better. I don't really have a good answer for you aside from "more of everything." Personally, I plan to send a letter to each of those main addresses, then probably again later when I make a new video specifically on the topic. 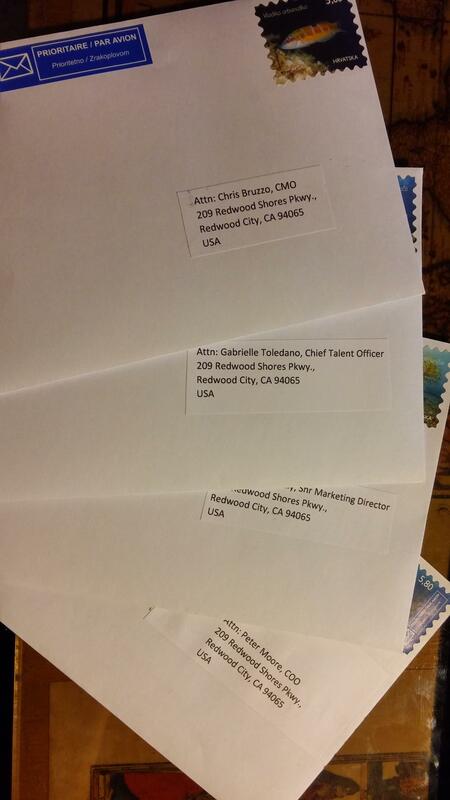 If I get better addresses from some sort of EA insider, I'll send ones to them too. Just sealed these, gonna send them out tomorrow. The envelopes and the stamps cost me the equivalent of 5 USD, and since I live in Europe, that doesn't seem much. Who knows when and if they'll arrive. I just used the letter Ross posted under the video, with the addition of my signature. Maybe next time I'll think of something original to write. Hopefully this will end up meaning something. P.S. I am unashamed to admit that I'm just bragging with this post. Am I allowed to do this? Oh no,you're not, this is hideous and you should be very ashamed. Giving proof that you're trying to help and maybe giving encouragement to people that wasn't sure this would be real. I'm pretty sure this was the worst thing i've ever seen, having the courage to be the first to prove you've send something...terrible, just terrible. What is the music at the credits? It isn't listed in the credits. not that im suprised anymore PCG picks news up late.. But there seem to be tons of fans in comment section referring to you and RGD, wondering if PCG got this info from.. RGD. There is a tortoise and hare quality about this whole endeavour. I'd like to think we can make meaningful dialogue with EA through civil agitation rather than intermittent and explosive abuse. We have to be extremely careful that this campaign doesn't descend to that level. So, is this thing still going? Any reply from EA yet? Aye, still in pre-alpha though. Very unlikely, as this will need to be a much more prominent thing for them to be compelled to even take notice. No replies, but don't worry, it's still going. I have plans for some more stuff I'll discuss in the next videochat also. Actually, it's worse than that. At least if you find your computer can't handle a game, there's things you can do about it, and someday maybe you'll be able to play it. When a game has been intentionally killed, it's just over and there's no chance at all.